(LtoR): John Gayer, Joanne Maki, Mark King, and Dean Graves. 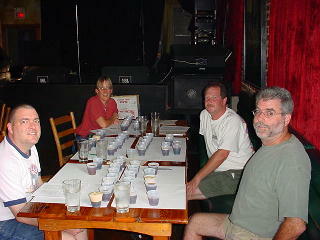 Owen Ogletree (director of Brewtopia Events) gathered together some of his devoted beer loving friends and brewers in August of 2002 at Tasty World Bar in downtown Athens, GA to sample and comment on several mixed styles of high alcohol ales from England and other various areas of the United Kingdom. This beer sampling was done as a blind tasting where no one was aware of the brands that were being served. Beers were informally commented upon and ranked according to Beer Judge Certification Program guidelines. First, second, third places, and honorable mention were awarded to the beers we felt represented their individual styles in extraordinary fashion. 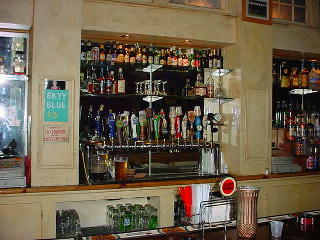 At this time, none of these world class beers are available for sale in Georgia due to outdated alcohol laws. Visit Georgians for World Class Beer to find out how you can help change these prohibitive laws. Drop Owen an email to share your comments and opinions. Aroma: English hops, toffee, honey, alcohol, sherry, cherry. This aroma is very complex. Appearance: No carbonation. Amber, still, clear. Flavor: Alcohol, beautifully complex, intense, fruity, and malty with a great lingering aftertaste. Smooth for this much alcohol. There are light hops in the flavor with complex, sweet, malty flavors. This is rich and delicious! Flavor: Plums, raisins, nice body, sweet, fruity. This is a well balanced beer with lots of malt and residual sweetness. Elegant and satisfying. Aroma: Slightly sweet and malty. Flavor: Vanilla, raisins, pineapple. Nice, big mouthfeel. Creamy, toffee, rich, big body. Great aftertaste. What an awesome beer! Appearance: Dark amber, good carbonation and head retention. Flavor: Hints of sherry, thick mouthfeel, viscous, smooth, complex, flavors of toffee and caramel. Aroma: Sweet oats, caramel, molasses. Appearance: Creamy head, dark amber/copper in color. Flavor: Soft, subtle sweetness, malt is plentiful but not overdone. A bit cloying in finish, however. This is a nice beer that is big in flavor. Aroma: Roasty hints, hop undertones, honey, caramel, butter. Appearance: Creamy head, dark amber/copper. Flavor: A bit astringent, hop bitterness is there, needs a bit more malt character. Should be a bit sweeter for more balance. This is still a remarkable beer -- very flavorful. Aroma: Caramel, oxidative qualities, light aroma. Appearance: Garnet, dark amber, nice. Flavor: Hoppy, dry, light body for style. There are a bit too many hops for style -- needs a touch more malt and body. Very delicious, but a bit thin for this style. Aroma: Light, fruit, alcohol, toffee. Appearance: Ruby, garnet, glowing, clear. Flavor: Flavors of phenol/plastic-like. Vanilla and malt. Appearance: Viscous, thick, no head, black in color. Flavor: Salty, olive-like. Grain flavors covered by possible infection. Soy sauce, needs more malt and roast character. Thick body. Needs to be cleaner. Aroma: Malt, currant, honey. Needs more spruce/pine aroma. Appearance: Clear, copper, beautiful, low carbonation. Flavor: Spruce/pine is in the background. A hint of resin in aftertaste. Syrup-like, nice body, coats the tongue. Needs more spruce/pine character in flavor as well. We'd like to thank Tasty World for hosting our tasting. Tasty World has a fine draft selection.